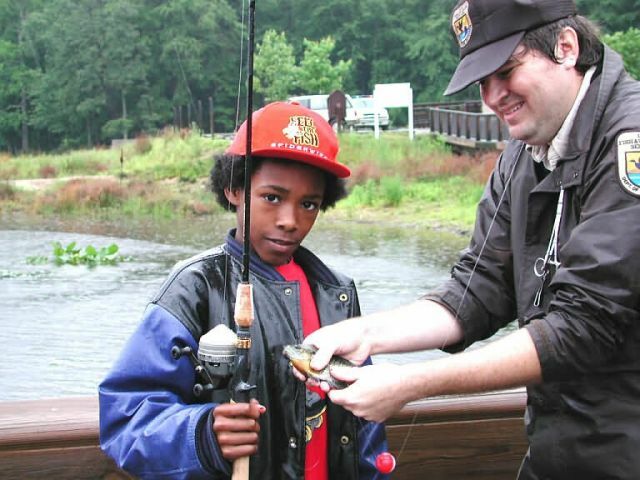 Area urban youth enjoy fishing opportunities provided by FWS at Patuxent Wildlife Research Refuge Kids Day Fishing Event on Cash Lake. The event provided fishing guides and fishing opportunities for urban youth as far as many, this was their first time ever fishing, Although rain fell most of the day, enthusiasm was high and many young anglers young and old caught fishes including bluegills and crappies. Everyone dined on warm pizzas served afterwards in the visitor center. Photo taken: June 7, 2003 ELECTRONIC IMAGE ONLY!